More On That Keeping Calm Bit | A Consequence of Hypoglycemia. Last week I decided to play off of the ‘Keep Calm’ posters/shirts/whatevers that have been passing in and out of consciousness – mostly because I couldn’t think of anything else to title a post. Most often that’s the most difficult part of getting one of these things published. And if you’re paying attention, there’s a good chance the title has absolutely nothing to do with the content. Which makes total sense from an SEO and web content perspective. Not like that’s my job or anything. Oh…wait a second. Those of you that are Facebook friendly have likely seen the Type 1 Diabetes Memes page and experienced its abnormally high levels of awesome. If not, go check it out. I’ll wait. I humbly submit this image, and more importantly this page that creates/designs these posters to the Type 1 Diabetes Memes participants with the hopes that the collective will come up with some truly creative and ridiculously hilarious ideas. 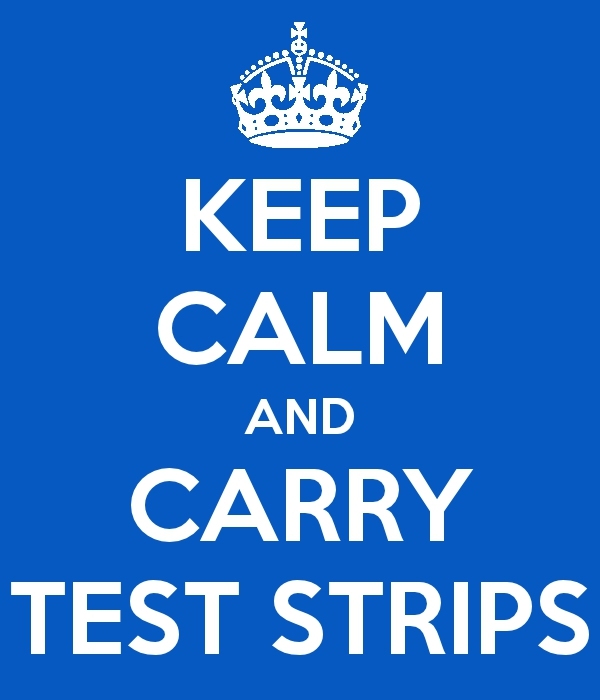 ← Keep Calm, Carry Test Strips. Great job creating this and on your most recent recognition!